I can't speak highly enough of this company and their products. I received one in 2003. Since then, I've carried it all over the world including a war zone, on business, to conventions, while driving. I've stuffed it to the point where I needed a knee to apply enough pressure to close it. It's been dragged, carried, tossed, shoved, buried under luggage and cargo, through airport security hundreds of times, and there's not a loose seam or worn zipper anywhere. It seems to be as indestructible as textiles get. While this style is no longer available, it's demonstrative of the breed. Timbuk2 started in San Francisco, designing and making bags for bicycle messengers. They still act like a small company in terms of service and support, including a lifetime guarantee on materials and workmanship, spare straps and hardware, and a 20% discount on a new bag for trading in an old model, in any condition. My particular model is the Data Dump. When stuffed to what should be a breaking point, it exactly fits the carryon size limits for aircraft. The shoulder straps are comfortable, contoured, designed for people with shoulders, adjustable, with a hip belt. The laptop compartment is padded enough to cushion a computer, and to pad against the wearer's back. The accessory pockets are integral, collapsible, and well thought out, with lots of mesh, slots and loops for compartmentalizing stuff, from business cards and pens, to toiletries and computer accessories. The main compartment opens wide for access, then zips closed and latches down to minimize profile. The outside is tough and sufficiently padded to keep contents secure. The bottom is a tough rubber over nylon. 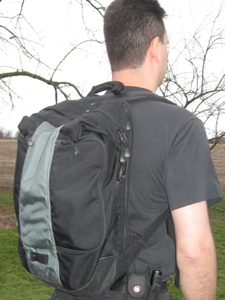 There are thumb loops/carabiner attachment points on the shoulder straps and back, and a sturdy, solid carry handle atop with a stitched in piece of hose to reinforce it. Their models change regularly as new technology is developed, and they offer not only a variety of colors, but a build-your-own option for style, size and color. Some of their bags are imported, made under good supervision. The custom bags are American built (it seems more appropriate to say "built" rather than "sewn" for these engineering masterpieces). You'll pay a little more, but the quality is beyond compare for a travel bag/day pack/briefcase of this type. For a smaller, unobtrusive BOB or a reliable daily carrier, I can recommend this company's products without reservation.